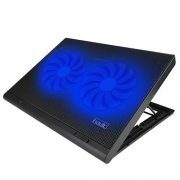 Measuring 900*300*3mm makes it provide larger usable area to cover keyboard,mouse and stuff on the desktop when playing game. High-quality fine mesh cloth cover make sure the mouse moving smooth and accurately.Gaming can be stressful, don’t let your mouse pad add to it! Waterproof coating can prevent damage from spilled drinks or other accidents, easy to clean. I admit that I should have paid closer attention to the actual measurements of this ‘mouse’ pad, because my intention was to use it to place both my keyboard and mouse on, but the thing is so darn BIG – almost 36″ wide, by almost 12″ tall – that it won’t fit on my desk! That’s a shame, because it is a very nice material that feels very good and that the mouse slides over very smoothly. I like it very much for providing a soft and continuous pad for the desktop. It’s well made and looks good. Gamers must have bigger desktops than I do, but I see that this is a typical size for this style of product. Well, I’ll take it to my office and use it there. I think the desktop can accommodate it. I do like it very much. If I find that it does not prove to be durable as I use it over time, or if I think of any other points worth mentioning here, I will return and update this review accordingly. I received a sample of this mouse pad, at no cost from the seller and for the purpose of review, and I have no affiliation with either the seller, or Amazon. If you don’t game, then you likely cannot see the value of such a large mouse pad. If you do game, and are familiar with the particular demands based on more vigorous hand movements or the need for a wider space to maneuver, then you might see the appeal of this product. The pad is large enough to cover the majority of a standard desk. I have an Ikea desk designed to accommodate two people in a compact space and this covered 3/4 of the space. I’m using it to use two mice – one on each side. I like to have Skype running on a separate computer and display so that it’s not taking up processor cycles while I’m gaming. There have also been occasions when I simultaneously run multiple instances of the same game. This mouse pad allows me to maneuver both on the same continuous surface rather than to clutter my desk with multiple small objects. The mouse pad itself is very “old school” in terms of quality and I mean this in the best possible way. It is thick, has a strong rubber backing, a smooth matte top, and well-stitched edges. The angular design of the eagle and the bold colors match the look and feel of most gaming hardware. Tracking on the mouse pad is excellent. The mouse glides smoothly without reflection or bounce back from the laser. If you put a laptop or keyboard on it, provides a more comfortable resting surface. If you live in a place with cold weather in winter (and I do), if functions nicely as a little “carpet” to protect you from the chilly desk surface. Beyond the functional aspects, this is also practical in terms of speeding up desk cleaning (which helps with maintenance of the mouse and peripherals). A lazy person can just pick it up and shake it out to clear a wide surface at once. It also is just plain cool in appearance and adds a touch of gaming culture atmosphere to your computer use experience. Note: I was given a free sample of this product in exchange for my assessment. Awesome gaming mouse pad. The HAVIT HV-MP830 is very thick and the quality is far superior than the other mouse pads I’ve purchased. It gives my desktop a nice slick look. I would definitely purchase this again. This review is for the HAVIT® HV-MP830 35.43″ x 11.8″ x 0.12″ Computer Gaming Mouse Pad. These new breed of extended pads were initially intended to be used on a desk and placed underneath your keyboard and mouse. They are, however a must have for those of us who like to game in the comfort an armchair rather than an office chair with the use of either a homemade tray or something like the NerdyTec CouchMaster. They are not simply just a mouse pad, as trying to use one as such you will find the dimensions far too unwieldy. With the mat sat under a keyboard, you will find it provides a heightened level of slip resistance to your keyboard and an improved level of comfort for your wrists. While the mat is not foam backed or even that thick the difference is, however noticeable when using a keyboard on a hard table and even more so if your keyboard lacks a wrist rest. The remaining space left for use as a mouse surface is limited. The problem isn’t so much the available width, but the lack of depth. The only advice I can offer is to use a high DPI mouse (3200DPI is fine) and within a couple of weeks you will adapt and it does become second nature. Both mats come in similar style rectangular boxes, the Razer box is of higher quality but you are paying for it. The HAVIT packaging in terms of quality is perfectly acceptable. There is, however a rather serious point of note to be made about the HAVIT packaging, it’s too small. The Razer mat is simply rolled up and stored within its packaging; the HV-MP830 has a fold about a third of the way down and is then rolled up. Out of the box the HAVIT mat has a noticeable kink in it where it has been folded and even after a week this is still very noticeable. It’s getting better, but I think it’s going to be some time before it eventually levels out. If you are so inclined, you may be able to resolve by placing a piece of cloth over the mat and ironing both sides, just do NOT directly iron the mat as it contains rubber. I did try leaving my CouchMaster on top of it overnight to try and flatten it out but it had little effect. It should also be noted that out of the packaging the edges of the HAVIT mat are slightly curled. This was not a problem ever suffered with my Razer mat, however this is something that is self resolving during use and clears after about a week. I have contacted HAVIT and asked that they seriously reconsider the size of the product packaging and the way the mat is contained within. The box needs to be marginally larger and most defiantly not folded before being packed. Please note that the only mats I have ever owned that are of note (or rather that I can recall) are the Razer Control Extended, A foam back Razer control mat from around 2007 and an ICEMAT. I have never owned a Razer speed mat so cannot compare to the texture of those pads. The surface of the Razer Goliathus Control Extended mat has a noticeable coarse texture. Spaced every 2mm there are small indents in the material which only serves to exaggerate this against the skin. While it is soft and with gentle movements, it is unnoticeable and comfortable to use, however should you make frequent swift movements over the surface with an uncovered wrist such as when playing fast paced FPS games, chafing and soreness will ensue. The surface of the HAVIT HV-MP830 in contrast, is completely different. Touching with a fingertip the HAVIT pad also feels slightly coarse, but on the wrist the difference is significant. The surface of the HAVIT pad also has indentations on the surface, however they are smaller and far more tightly packed together than those of the Razer and as a result is much smoother and causes no friction on the skin whatsoever. 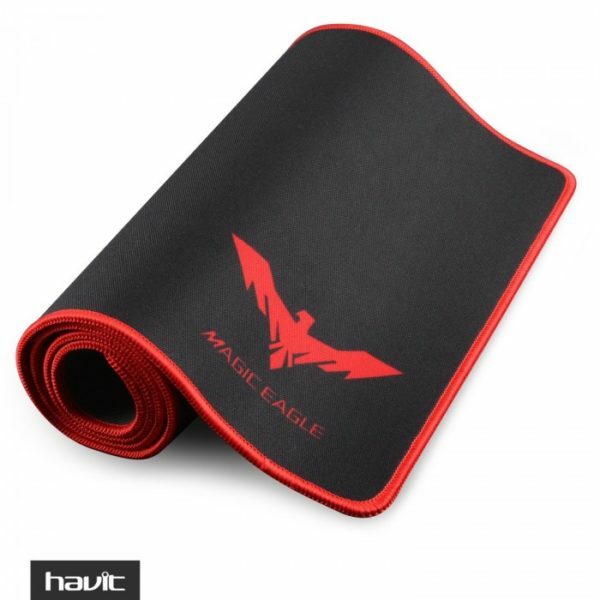 I could rub my bare forearm over the surface of the HAVIT mat all day long without irritation, something that I would not contemplate doing on the Razer pad. In terms of comfort the HAVIT is far more comfortable to use for fast paced action / FPS games. For most other games they are equal. The backing of both mats is noticeably different. 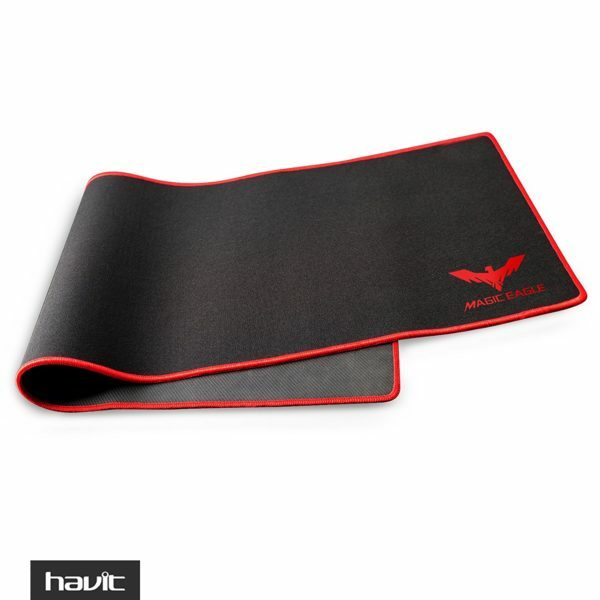 The rear of the HAVIT mat is a slightly smooth, rubbery texture and has a distinctive diagonal tread pattern and the Razer mat has a raised oval pattern tread that feels slightly coarse. I tried various methods to test the slip resistance of the mats on varnished wood, melamine and plastic. Trying to push them along the surface, dragging them along the surface and even draping them over the edge of the surface at different lengths to test slippage. The Razer underside is noticeably better, but only marginally and in real world application, there is absolutely no discernable difference between them. 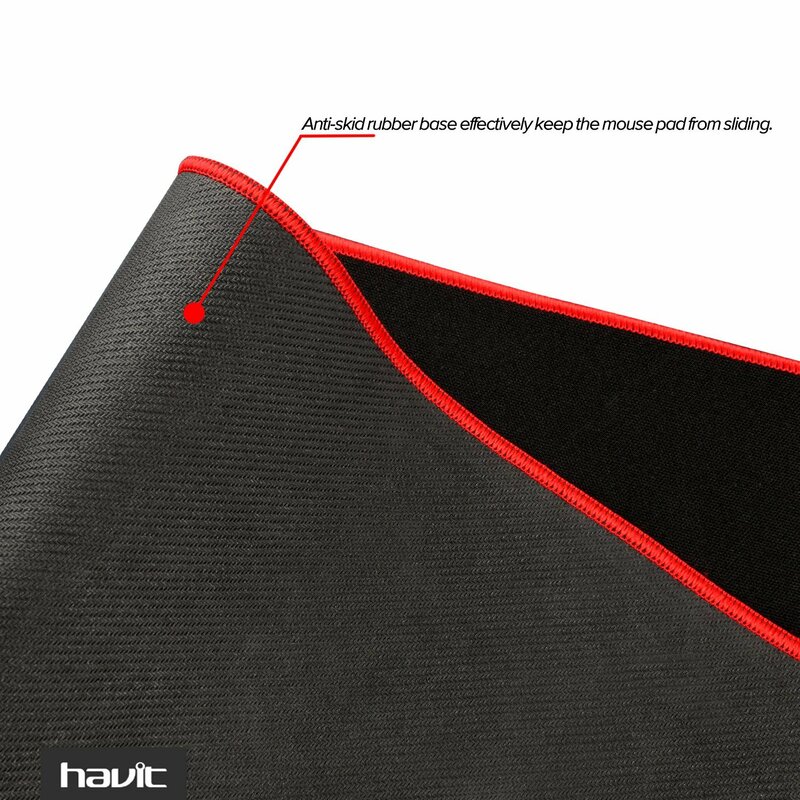 While equally as capable there is a problem with the HAVIT mat underside, it absolutely stinks. I have been suffering with the flu for a little while now and am slightly bunged up, but with the mat anywhere closer than 12” to my nose the stench of rubber is overpowering. I have had similar problems with other items I have reviewed in the past and my method for dealing with such problems it is to hang on a washing line outside over a weekend spraying with Febreze each morning. This has largely solved the problem and now unless I intentionally stick my nose up against the mat the scent of Eau De Michelin has gone. The edge of the Razer mat stitching is very dense and taut, the quality is relatively consistent and the workmanship is good. Razer claims that this edging is anti fraying, but it isn’t, my extended mat is about 11 months old and has had infrequent use and the edges are bobbling quite badly in places. 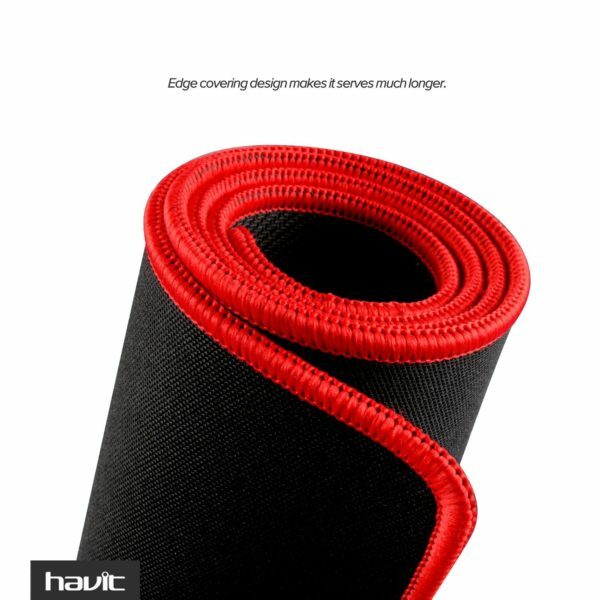 The edges of the HAVIT mat are well stitched and in fairness do look more aesthetically pleasing. It is fairly dense on the front, but not so much on the back, this stitching is however not very taught. This isn’t a major issue but if you do wear a watch there is a slight risk of catching it in the buckle which could very easily cause it harm. Long term, it’s hard to say much about this section and is possibly something that I will have to revisit after a more extended testing period. Well, I think it’s fair to say I’m comparing the wrong mats. The HV-MP830 I believe should ideally be compared to the Razer speed mat, but sadly I am not in a position to do so. While the accuracy of the Razer control mat is uncompromising it isn’t a mat with which mice easily glide over, there is a noticeable friction and it isn’t a surface for twitchers and 180 ninjas. The HAVIT mat is for the most part at the other end of the spectrum. Using mice that do not have gaming class smooth feet or aftermarket pads on the HAVIT pad they still glove over the surface like water on glass. While the HV-MP830 is a pad for FPS players, but most defiantly not a pad for skilled snipers. The HAVIT pad is perhaps a little dull, bland and even uninspiring however, given the cost this is easy to forgive considering how functional it is in comparison with the vastly more expensive but more attractive Razer Extended. 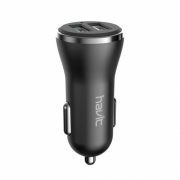 Is the HAVIT HV-MP830 worth the money? In comparison to the Razer extended, very much so. Is the Razer Extended better? 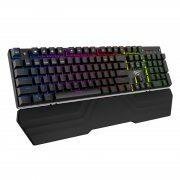 Is the Razer extended worth the money? Full disclosure, I was provided with a sample product in exchange for a fair and honest review. No attempt was made to influence my opinion and my review is my own thoughts based on the use of this item. A surprisingly large, fabric-textured mouse+keyboard pad. The large size avoids the problematic “mouse running off the edge of the pad” during large-scale movements (you first person shooters twitch-gamers know what I’m talking about), and the fabric provides an even tracking surface. I’ve gamed on metal gaming pads before, which also provide an extra-consistent tracking surface, but the sound of the mouse moving on the metal gets annoying to anybody nearby not wearing headphones. The mouse is very quiet on this surface. The red edging and “Eagle” design add a little extra touch that fits well with the gamer-oriented marketing. The mat material feels substantial, like it won’t tear anytime soon. My only complaint, is the rubber-like backing. It has an vile, chemical scent. Intensely rubbery, and it takes days to fade. I generally have a less-sensitive nose (the result of years of allergies), and I found the smell overpowering (plus, I try to avoid inhaling off-gassing VOCs). Expect to air this mat somewhere unoccupied before use (a garage does nicely). Pictured: With a Logitech Illuminated Keyboard and Logitech Anywhere MX Mouse. It’s a great large-area gaming mat, apart from the smell issue (for which I dock a star). Great mouse pad! Really nice and large. Great mouse\keyboad pad. This thing is literally the length of my desk! My mouse works well on the pad and i have space on the other side of my keyboard to put my phone and wallet so it help me keep everything nice and neat on my desk. The past us the perfect size and great quality. They added there website link in the corner of it so I don’t like that. Over all if that dosent bother you it’s great! Fits perfect on desk, using for gaming. It fit my desk great. MY desk is a little over 3 feet so the mouse pad sits on it perfectly. I have the front half of my PC, my Havit Mechanical keyboard, and my blue snowball resting on it. After all of it I still have 10-12 inches to move my mouse. I used to use a plastic mouse pad, so i was worried about the increased friction. I found it moves great with the large glide pads on my zowie ec2-a. Overall I enjoy and am satisfied With this mouse pad. I got the Magic Eagle Mouse pad the other day to use. Now I have had a few mouse pads before but nothing as large as this one. I think the larges I have used before was around 13 inches by 12 inches wide. So moving to this one which is 35 inches long by 12 inches wide was a nice change. I like a large mouse page since I do a lot of work from my desk. This mouse pad fit’s great across my desk as you can see in the photos. The anti skid bottom holds in in place great. The stitching around the edges make it so my braided mouse cord wont ketch anymore. Cleaning it should be easy also just use a soft wet cloth then let it air dry and you should be good. The fabric is smooth and feel nice when rubbing your hands across it. When using your mouse it slide smooth and effortless which is nice some mouse pad’s don’t give you that much ease. Havit did a great job designing this mouse pad. I would love to see it in other colors down the line for people who like to color match there computer builds. Disclaimer: I received this product at a discount in exchange for a thorough and accurate review. All opinions are 100% mine and mine alone. Looks great in person, better than the picture. The only reason that I rated 4 stars is because this came rolled up so now it has a big crease down the middle. I am OCD so this crease is kind of annoying. I’m going to try and steam press it to straighten it out. Also, the website url is in the top left hand corner in which you can’t see in the picture. I have it covered by a picture on my desk because I don’t like the advertisement there. But other than that it feels great and looks great. It holds still on my desk but my mouse is quick across the surface. 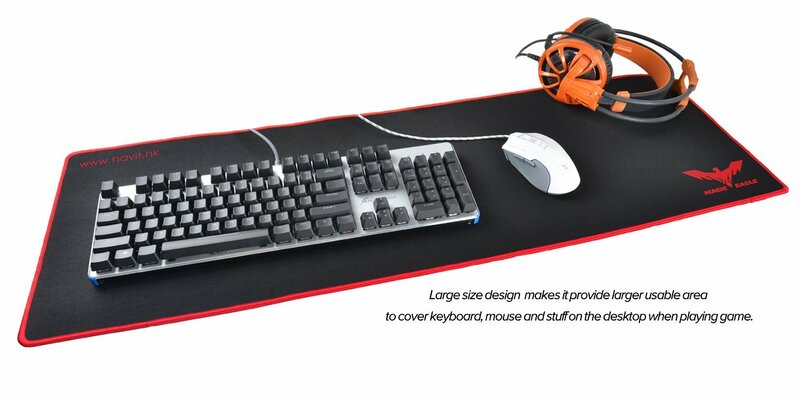 If you’re looking for a BIG mouse mat, this certainly fits the bill. It’s one of the thinner mouse pads I’ve used, which is good since it comes tightly rolled into a box (though I think that’s pretty standard of extended mats) and takes a little while to lay fully flat. The stitched edges both feel nice and should keep the top fabric from coming detached for a very long time. Only thing keeping me from giving it 5 stars is that it’s still flattening out from being rolled up, but once it does lay flat it’s easily a 5 star product. Extremely nice mouse pad for the price, I also have a desk sized Razer pad and this was half the price with all the quality. Friendly customer service, emailed me to see if everything was fine with the product. I’ve bought two of these already and they’re amazing. Very high quality and they look great! just right for you keyboard to sit with plenty of room for your mouse. reinforced edges are great no frying here. For a stitched desk-spanning mousepad, this thing works great for the money. And it is wide. Wide enough to sit a Corsair K70 keyboard on the left without taking more than half of its width up. There’s a moderate amount of resistance from the fabric, so I’d say it falls under the “control” category of pads and it tracks well on my Zowie FK1, which is great since this mouse refuses to track on most surfaces. By virtue of its sheer size, and the fact that my keyboard sits on top of it, this thing won’t be sliding anywhere, ever. It also appears a bit “blacker” in person, which together with the red makes for a striking aesthetic, but will probably get somewhat dingy over time. Now for the cons… My primary concern with this pad is that the material they used to stitch the edges seems to fray fairly easily around the corners. Also worth mentioning are the creases that are left on the mousepad after you unroll it from packaging that refuse to flatten out. All in all, mostly aesthetic complaints and not really worth taking a star. It’s huge…. Allows me to have maximum movement with my mouse, love it! I have been using this mouse matt for about 2 months now and have no complaints. The surface is semi slick compared to my Raa but great quality product none the less for the price. Would buy again and recommend. Great size mouse pad and very comfortable to use. My setup is Black and Red, so this goes perfectly. Five stars. My nephew loves it. this thing is great! it allows for my entire desktop to sit on top of it and looks great as well as functions fantastically. my only one little teeny tiny gripe is the stitching in one corner is frayed out of the box so had to trim it up a bit with some scissors and hope it doesn’t unravel any more. but this in no way effects the function of the mat whatsoever. for the price i don’t think you can beat it! a definite recommendation for sure. Exactly what I had expected. I love it and it goes great with my red and black set-up. It’s a nice, big mouse pad with a sleek design. It fits perfectly. It doesn’t slip or anything so it’s nice and stationary. It arrived in a timely fashion and fit well with my set-up. It is nice to have extra room to move the mouse. The first thing I will say about this mousepad is that it is massive. It is not quite as large as a “Master Gaming Race” XL mouse pad, but it plenty large enough for a gaming keyboard + gaming mouse. The sewn edges give the mouse pad a very premium feel, and the red accent really makes the product pop and stand out among other gaming peripherals. The surface of the mousepad is slightly rough, it feels like a high quality denim material, but I’m not certain what it is. The surface isn’t BLACK BLACK, its like the dark grey you get with black denim that is slightly worn through. The underlying material is a neoprene that gives the entire mousepad a good grip to my desk surface. Mouse-ing over the surface feels great. It is a little different than the “speed” pads I’ve used in the past, the rougher surface gives me a bit of feedback that is appreciated. My only concern is that it will collect skin, dust, and general grime over time. I will update this review if needed as time goes on. My only complaint is with the large red HAVIT logo on the upper left hand corner. 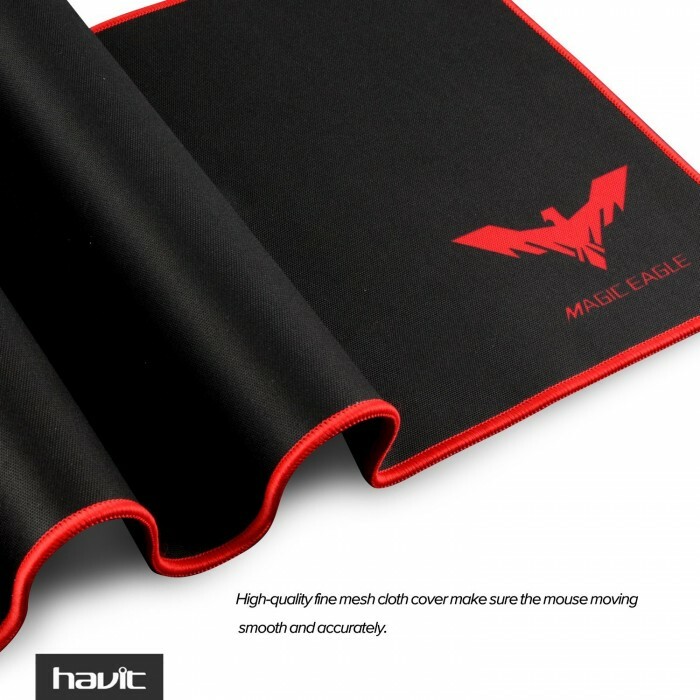 The “Magic Eagle” on the lower right looks fine, but the other HAVIT one detracts from the look of the mousepad. My keyboard mostly blocks my view of it when I’m typing, but just knowing that it’s there bothers me. -Textured surface is a pro for me, might be a con for others. I am a shopper and consumer, so I rely on the honesty of reviews to help gauge my buying decisions. I strive to make sure my reviews are honest and detailed so that others can benefit from my experience. 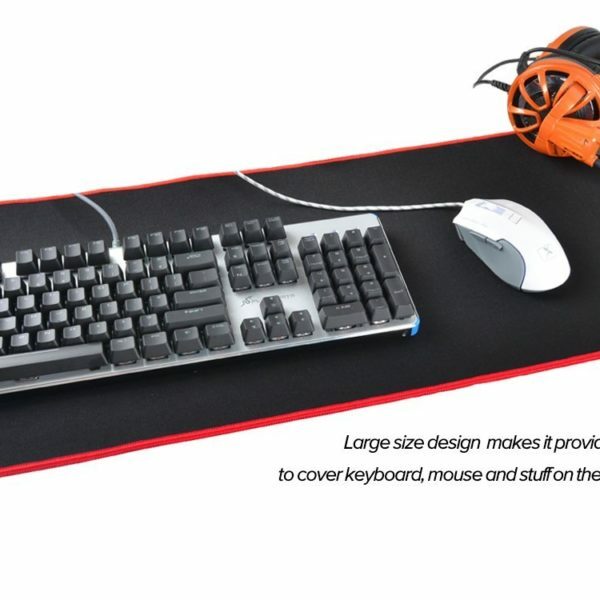 I am looking for a replacement mouse pad and I have always use the extra large mouse pad can pretty much cover the desk. The mouse pad arrive in a very good looking box. When I take out the mouse pad for some reason the pad is rolled in a very strange way and there is a crease on the pad (picture). I tried to roll it and press it with something for a day and is noticeable but not bad. The pad itself is very good quality, it got a good weight to it. The pad don’t slide thanks to the grip on the bottom and the top surface and very smooth. The pad have a decent thickness to it and I do wish the pad is a little taller, after the keyboard there isn’t much room left. Other than the way the it came in created a crease on the pad. The pad itself is very good quality and if you are looking for a pad for your mouse and keyboard. This pad will be perfect for those who have glass desk. I did received this product at a discount in exchange for my honest/unbiased review. I might be the only one here but I use this at the vape shop I work at as a coil building mat. It helps keep everything organized and keeps my counters clean from eliquid. the 3 stars is reflective of MY application only. Everyone is different and may use this for multiple different reasons and applications. The reason I have given this a 3 star review is because on top of a glass counter, this mat slides. Which is aggravating but I gave worked around it this far. The second reason is due to me being one of 3 different employees at this vape shop, my employees enjoy nothing more than using my equipment and putting everything out of place when I’m not there. This being said I have to roll this pad up and put it back in its box (which btw, great packaging Havit. A+) and I have to put it in my backpack and bring it back the next day. Therefore this mat never stays truly flat. The end will curl up as well as the center. Other than that the color is spot on with the stitching and the packaging is top notch. For my application this mat is 3 stars due to the setbacks that don’t help me. Another quality Havit product. This mousepad is a lot thicker than I had expected, I was thinking it would be more like the magic the gathering playmats thickness, but was pleasantly surprised. It is well made, great stitching, and the surface is like glass sliding my mouse across it. Fits the keyboard and mouse, with plenty of room to spare. I have also used it to play card games and tabletop games on it. Works wonders for just about anything. The price is great too. I got a discount on this for reviewing purposes. Bought this for my brother and he loves it! True to size. Great top surface, having room for my keyboard on top really helps keep the mousepad from moving around with my mouse. I wish the bottom were a bit more tacky/sticky. While the extra weight helps keep it in place, it still moves around a little across my desk. It didn’t lay flat out of the box due to how it’s put in there. A few hours under my textbook solved that. its great, around 2 feet long room for key board mouse speakers and a drink and sometimes a bowl of frosted flakes! Super soft, and a great surface to slide my mouse on. It is really long, so make sure you measure out the surface you are placing it on to make sure it fits. Its easy to get small tiny crumbs stuck inside the small tiny separations in the fabric, but easy to clean out as well. As described. I will be buying another for my office. Smooth to the touch. Fits both keyboard and mouse. As you can tell in photos and pics, red and black colors. Highly recommended for gamers! This is a very nice mat. I have it on my desk and it makes for a good rest for my hands as well as a good mouse pad. One major con, be careful what you put on it because it will stay on there like carpet… crumbs, hair, etc that usually would get stuck in a rug, carpet, or blanket. Perfect pad for my setup. I have Asus G752VY, Razer Orbweaver and Logitech G900 mouse. This pad can fit everything without any problems. Packaging was very good, but first smell of it was aweful, so I left it outside for 1 night. After that, it was good. Next thing, I really like Havit logo in bottom right corner, but in top left corner there’s written “WWW.HAVIT.HR” that really pokes my eyes, so I tried to hide it with razer orbweaver. Anyway, pad is perfect if you wanna use it with laptop. Very good mouse pad. Bigger than what I expected, however covers my desk perfectly. Easy to wipe off spills and my R.A.T. 7 mouse performs better on this surface. I recommend this product. Does the job. As advertised. My son wished the logo wasn’t in the corner at the bottom as he wanted an all black one, but he’s a teen. 🙂 It is a good quality. Great love this mouse pad, best I have ever had thanks. Very big. Fits my desk perfectly. This pad is awesome, it’s really big and it is able to fit my keyboard and my house, both of which are red and black of course, have to match, you know? Its excellent! Loved the quality and the mouse goes super soft on it! My first extended mouse pad and I love it. Great quality feels very premium with the packaging and pad itself. Would buy recommend to everyone who ever wants one. Awesome mousepad. As good quality as the highend brands. Will buy again when needed. But since it is washable that will be a while. Thanks HAVIT. This is a great product! I love this mat! It makes your desktop look and feel professional! 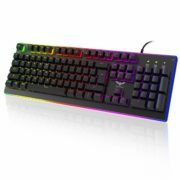 It pairs great with the cm storm keyboard and mouse combo(Cooler Master Devastator – LED Gaming Keyboard and Mouse Combo Bundle (Red Edition))! the stitchings on this mat are well put together. Once i Harb it placed down, it was solid and the non slip bottom made it so. No issues, looks great for a black and red scheme desk. Stays flat, no funny smell and it looks nice. it’s holding up well. You wouldn’t think that you needed a mouse pad big enough to cover your desk, but it turns out that it works really well for gaming. There is no need to recenter your mouse if you turn down your dpi for fps games, allowing you to have the room to flick out headshots while keeping the smooth aim speed for the rest of the time. The red on black looks pretty slick too; just enough color to attract the eye without it being distracting. Not much to say. Arrived quickly and works as intended. This is the first huge mouse pad I’ve ever used so it takes awhile to get used to, but it is nice to have so much space for mousing. I love the edge stitching too, this feels like it will keep in good condition for a long time. Make sure you measure your desk space before you buy, this is huge and needs a large amount of space. i love the feel and look and its quality is unquestionably great. It’s OK. I like the red border and it goes well with my new setup but the mat attracts dirt and other stuff that I can’t seem to get rid of. How to I clean this thing????? I originally bought one for my brother in law because he desperately needed one and was always complaining his was terrible. Then I had to buy one for my husband cause he got jealous of the big mouse pad. Mind is about half the size (which is still way bigger than a normal mouse pad) and I’m contemplating getting this one as well. It’s huge, we’ll made, preforms incredibly well, and I see it lasting a long time. This is the best gaming mouse pad I have ever owned, not only is it durable but it is also amazing looking. Now i just need to get a keyboard that lights up Red to complete the red and black theme i have going. 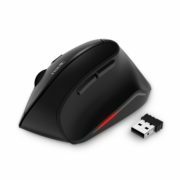 The stitching is great around the edges and gives it a quality look and feel, my mouse glides across it with no problem at all and it is the perfect size for a gaming keyboard and mouse for fps games. I have about 14 inches of space on the right side to move my mouse around for counter-strike and any other shooter games that requires a lower sensitivity. – Some people have been complaining about the bump you get that wont flatten out once you take it out of the package. i have not had that problem at all, it flattened out on its own the same day i got it. Honestly, if you are thinking of buying it….Do it! this thing is awesome. Coming in at no surprise I really like this mouse pad. My only problem is that it is not big enough. I like having my keyboard on the same pad as my mouse. I feel like it just ties that whole input system together Id like it to be a little bit wider however. The 12-inch width isn’t big enough for me. When I’m gaming I like being able to use my mouse over as much space as possible. Very nice gaming mat, excellent quality, and looks great. Sturdy and well made. It fit perfectly on my son’s desk and protected the studying surface. Came packaged well and true to description! Better than expected. Great price! Fantastic quality, very cheap price. Rubber backing provides for little movement or slip. It’s much larger than I expected. Care if you have more limited desk space. My desk is pretty big, so I love this for my gaming setup! To be honest one of the best gaming pads I’ve used over the years. Looks great, feels great, the stitching on the edge helps out by not snagging my mouse cord. For the price you can’t beat it. Would recommend to a beginner and a avid gamer. Very satisfied. Couldn’t have been happier with getting exactly what I payed for for! It’s nice and long, definitely long enough for key board and mouse, though for me I have an irradic hand and believe it or not actually comes off the top from time to time. I have been using this mat for a little over a month now. I wanted a larger surface for my gaming mouse so I could rely less on my wrist while playing. This has helped not just my aim, but my wrist pain as well since I can use more of my arm for aiming. The red and black color scheme fit my PC build’s other parts very nicely. The braided ends are very welcome and help keep you from moving your mouse off the mat very easily. They also help prevent fraying from regular use and friction from your arms and wrist. It comes folded in half and rolled up in a large tube. This does leave a crease down the middle which some people have complained about but in my case, the crease just went away by itself within a few days. My keyboard was laying on the crease so it did not really bother me or disrupt the mouse while it was working itself out. I use a Logitech G300s mouse and have absolutely no trouble with the mat’s surface. My movements appear to be registered accurately and the mouse glides across perfectly well. The surface also doesn’t pick up pet hair as easily as my old Steel Series mat did and cleans off easily with a damp cloth or with a lint roller. The only thing I might want would be about 2 inches more width on it since I underestimated the size of my desk, but that is no fault of the product. Just what I needed! I love this mouse pad it’s huge! Covers the entire side of my desk. I move my mouse around a lot as a part of my job and was sick of having to re-align on my little 8″ mouse pad. This has fixed any problems I had. My HAVIT mouse slides across this thing perfectly with just the right amount of friction. The packaging is high quality, I felt like I was opening a $50 mouse pad not a less than $10 mouse pad. HAVIT products have yet to let me down. There was no crease or roll in my mouse pad as some reviews have complained about. They must have changed how they fold them now, mine was rolled up and laid flat no problem right out of the box. There is a strong rubber odor the first couple of days but it quickly diminishes. See my attached picture for just how massive it is. Love this mouse pad would buy again for the other side of my desk if it would fit. Really high quality look and feel, works great for my black and red gaming setup and adds a lot of class to it IMO. The logo is nice without making being too loud like most of these pads. Stitching is very high quality and material is very thick and sticks securely to desktop. I’ve never heard of this company before but the price was right and the color scheme matches my PC. The box it comes in is very nice, hanging onto it. It comes rolled up perfectly inside and there were no bends in the material. The only reason I’ve given it 4 stars is because there is a Havit website printed on the front as well as the RoHs and do not throw away warnings. I’m not sure why those would be on the front, but regardless this is a great product at an amazing price. If you are thinking about buying this do it! This was probably one of the single most effective things I have added to my gaming PC that instantly boosted my performance in game. This mouse pad is quality made and looks great! This mamma-jamma is not only stylish, but it is COMFORTABLE. my wrists grew mouths and thanked me verbally for saving them from the cold hard desk surface -and I wasn’t even on drugs that time! I don’t know how I lived without this in my life.. for as many hours as I spend behind a computer screen (nearly all of them that I’m not sleeping or driving), this is a solid investment. You will not be disappointed. Easy packaging, just roll that sumbeach out and “sweet baby jesus” you’re ready to rock. I think this is a great creation. I use it daily. The pad is large enough for the keyboard and leaves enough space mouse. Not slippery, and looks cool on the desk. fabric trims on the edges make it look fantastic. I like it very much. Very roomy and very smooth, massive upgrade from my older one. The pad is of great quality. I like the “Magic Eagle” logo and the black and red colours. Love this mouse bad. It fits across my whole desk and helps keep the keyboard in place cool design, would highly recommend. Came nicely rolled so no crease, a whole lot of pad for thirteen bucks. Great price, excellent quality, less than comparable brands, looks good, performs well with my Mionix, and did not give me buyers remorse. My son uses it all the time. He loves it! A large high quality mouse pad, and when I say large this thing is huge. Great pad, buy one ! Nice and soft and thick which helps on an antique desk top! Good mat. Resists dirt and grime very well. Still flat after a year not curling at all. Looks fantastic and works fantastic. You can’t go wrong with a Magic Eagle Mouse Mat. CREASED! I’ve looked through all the review and I realized it wasn’t only me who had a huge crease near the middle of the mosepad.. I’ve had this mosepad for a couple months now and the crease is still there, even having the crease under 60 pounds of books for 2 days.. although the crease is almost gone, it’s still there! Mousepad is a great size and is very durable and feels very nice.. Kinda hard to clean aswell! This gives the space to spread out and not be cramped at your computer. Good depth and width. You will not be disappointed. This product is alright but not the best. It has a roll bump in the middle and i’ve had it for almost a year. I love the mat, it’s plenty large enough for a keyboard and a mouse. It is possible to run the cords under the mat with just a slight bulge. The RED border seems to fray pretty easily and looked a little worn out after a few weeks or months. Very large, comes in a durable carrying case. I was looking for a large mouse pad and this one is massive. Just what I was looking for. It fits my keyboard, mouse, phone dock, and any other small items I need. Very satisfied with the purchase. My son loves it work perfect on his desk for his gaming mouse. Wonderful mouse pad that’s great for low sensitivity gaming. The surface is very smooth and the sidings are stitched. Would definitely recommend, especially at this price point. This product is great it fits evrything on it and is amazingly smooth for mice. Can’t imagine why I haven’t had one of these for all my gaming years. Gone are the days of the sliding mouse pad. Passed my expectations. The quality, color and everything else about it is very nice. I am thinking about purchasing another one for my other computer! Picture doesn’t do it justice, as the pano on my phone was kind of blurry and distorted. It doesn’t lay completely flat and I didn’t realize it had a .hk domain on the top left. Decent for the price. This mouse pad is a great steal do to its cost and efficiency. I’ve never had a problem with t and actually ply competitive games on it. It’s smooth and allows me to feel comfortable when using it in tournaments. This is the best mousepad. It’s actually longer than my desk. More than enough room for my gaming keyboard and mouse. VERY satisfied with the materiel. Very comfortable at the office for hours. I normally don’t like the stitched edges, but they did it soft, so I liked it. This mouse pad is PERFECT for a large desk space. I love the red stitching and the eagle logo looks really cool. In other mouse pads the logo is like a sticker on top of the pad but this one is printed into the mousepad which means you can’t feel a difference when you mouse over it. GREAT BUY! looks and feels very nice!! Awesome! My smallish desk had some slippy-sliding issues before but after laying this behemoth across it now it feels like I have tons of room. The mat’s size and rubbery bottom prevent it from moving at all, and the fabric surface allows for barely any movement of my keyboard or laptop feet while letting my mouse glide effortlessly. Major quality for a great price. If I had to pick something to nitpick about it would be the overly large logo in the bottom right corner, but it’s a long enough mat for it to be totally out of sight anyway. No big deal. I’ll probably be picking up some of these for christmas gifts!